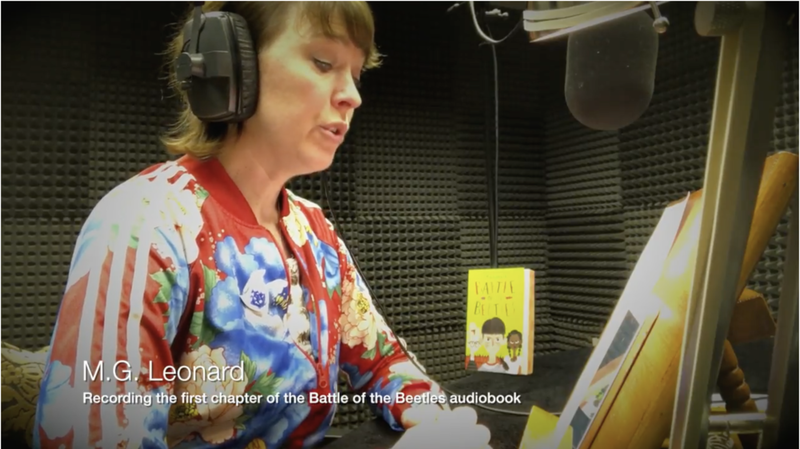 I often get asked what it is like to record an audiobook, so when I went into the studio to record Battle of the Beetles, I propped up my phone and videoed myself reading Chapter One - Beetle Plague. A useful video for classrooms or indeed if you are wondering if you want to read the third book in the Beetle Boy trilogy. To get the full effect of the audiobook please close your eyes whilst watching!!! LOL! Or for the full experience head to iTunes, audiobook or any shop that sells audio CDs to get the whole book. Enjoy! And please forgive the poor audio and lighting, my phone is only a little media machine. The audiobook recording is far better quality. Featuring illustration by Karl James Mountford. If you think reading an audiobook looks easy, below is a short 2 minute video of all my bloopers! Thank goodness for the producer, Carolyn.